It was Frank Lampard's 2010 World Cup strike that awoke FIFA to the need for goal line tech, said Richard Scudamore, Chief Executive of the Premier League. Before that Seb Blatter's FIFA told the Premier League not to continue with its plans to use technology to assist referees in goal line decisions, but as England crashed out of the cup, the mood started to change. This season the Premier League will introduce its Goal Decision System (GDS) for every game. Last season there were 31 incidents in the Premier League in which goal line technology could have assisted the referee, and Scudamore boasted that in 21 years of Premier League history, there's never been an incident that GDS couldn't have officiated on. The journey of FIFA and the FA to GDS's integration has been fractious, and even as it comes into effect the two sides haven't opted to use the same system. The Premier League has opted for Hawk-Eye, a system which will be familiar to tennis and cricket fans, where the system is used to review umpire's decisions within the game. However, implementing the technology into football has proved difficult. The stop/start nature of tennis and cricket both lend themselves well to a review system, where the free-flowing end-to-end nature of Premiership football would be destroyed by stopping the game to check if the ball has crossed the line – and could be open to abuse. The Goal Decision System, however, is completely different. It works using seven 340fps cameras trained on each six-yard box. They monitor the ball's path, watching to see if the ball crosses the goal line. If it does a signal is sent to the referee's watch, a process that takes under a second. If the watch vibrates the ref awards a goal, if it doesn't he waves play on. "FIFA states that any system must be accurate to 30mm,” said Dr Paul Hawkins, inventor of Hawk Eye. “However, our system is accurate to 3mm." With seven cameras watching down on the action, the ball can be picked out of the most crowded penalty area. What's more, the ball's pattern is uploaded to the system for extra accuracy, in case the system was confused “by other spherical items, such as bald heads,” said Hawkins. The Premier League system differs to the GoalRef and CAIRO system used in Europe, which requires a specially adapted ball, which has built-in electronic sensors which work with a magnetic field across the goal face. The Hawk-Eye system can work with any ball, as long as the pattern is uploaded first. 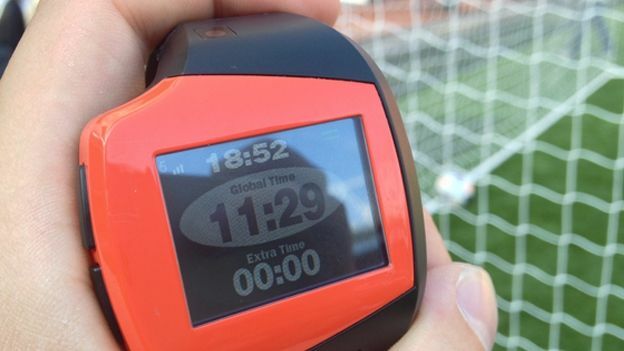 While Paul Hawkins had no doubts that his system works, describing the signal sent to the referee's watch as “a matter of fact,” Arsenal manager Arsene Wenger, who made a surprise appearance at the Premier League's GDS showcase at the Emirates, was typically skeptical, but supportive of the new technology. “My worry is where the ball goes over the line, then comes back, and then there is a foul on the defender. How does the referee, who blows for the foul, know it has not been after the ball went in? I suppose it's the same as when the ball is out of play from a cross and then there's a foul. But what matters is getting the decision right – anything is better than the ball going in and the goal not being given,” he said. While the Premier League is pioneering the use of technology, a trial this season in the Dutch KNVB league will take technology one stage further. Another Hawk-Eye system is being trialled that will use video referees to advise on other decisions such as offsides. It seems the era of technology in football has only just begun.